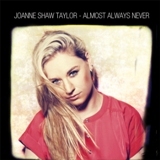 U.K. blues-rock guitar-slinger Joanne Shaw Taylor may not have come away from last weekend’s British Blues Awards with any prizes, relinquishing the best female vocalist honor she’s held for the past two years to Chantel McGregor this time around, but she’s certainly got a winner of an album in her brand new Almost Always Never, released this week on Ruf Records. With its smoky vocals and “it’s not you, it’s me” attitude, the dark, catchy “You Should Stay, I Should Go” is easily as good as any song you’ll hear on pop radio today, as can also be said about both the quiet ballad that is the album’s title track and the aforementioned “Beautifully Broken.” If Taylor didn’t take the world by storm through either of her previous albums, the dozen strong tunes – all but one originals – and plenty of smoking guitar on Almost Always Never certainly will. Batten down the hatches, my friends: this one will blow you away. This entry was posted in Albums and tagged Joanne Shaw Taylor. Bookmark the permalink.